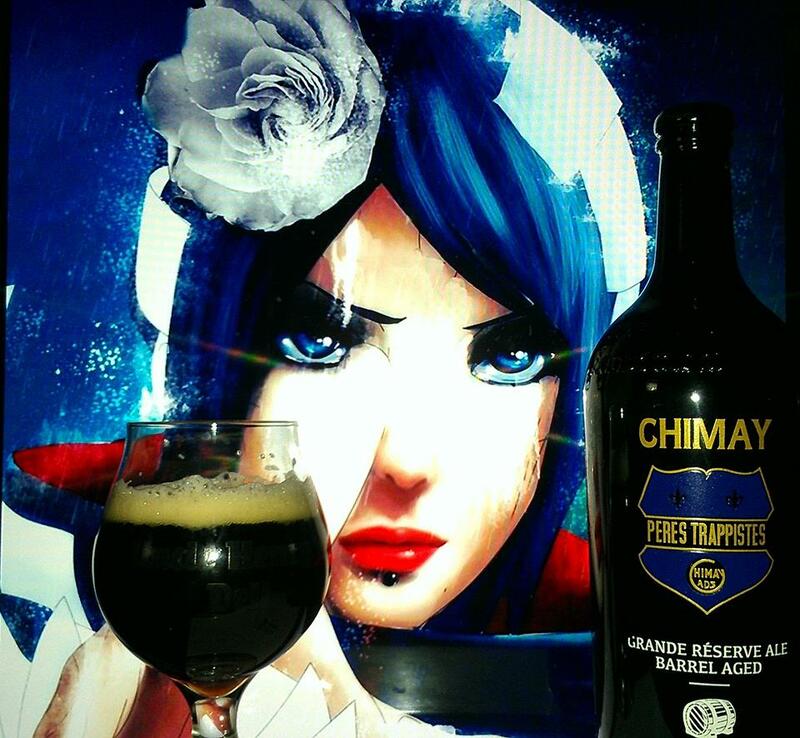 2016 Chimay Grande Reserve Ale Barrel Aged by Bières de Chimay S.A is a 10.5% ABV Belgian Trappist Dark Strong Ale aged in French Oak, American Oak, Cognac and Chestnut Barrels. The “Grande Reserve” Aged in wooden casks is an exceptional beer that benefits from triple fermentation and extended maturing in barrels. Unfiltered, unpasteurized, this beer has an incomparable rounded, wooden flavour. The barrel-aged Chimay Bleue of March 2016 stands out from classic Chimay Bleue thanks to the many nuances provided by the additional fermentation in wooden barrels. 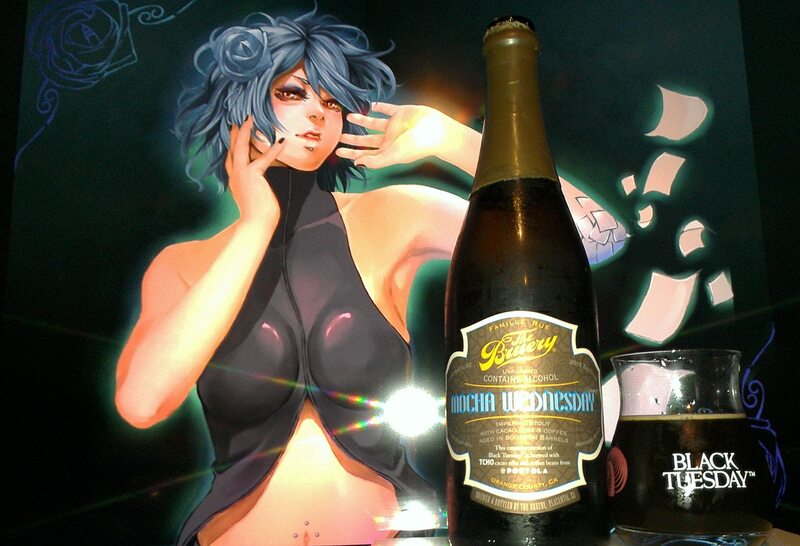 On the eye, the beer boasts a deep brown robe with a bright glint. It’s extremely fine and smooth foam also possesses a slight shade of cream. On the nose, notes of black tea, jasmine and wood are equally predominant. On the palate, the woodiness cloaks the bread crust, roasting, mocha and Cognac aromas as well as the empyreumatical notes. 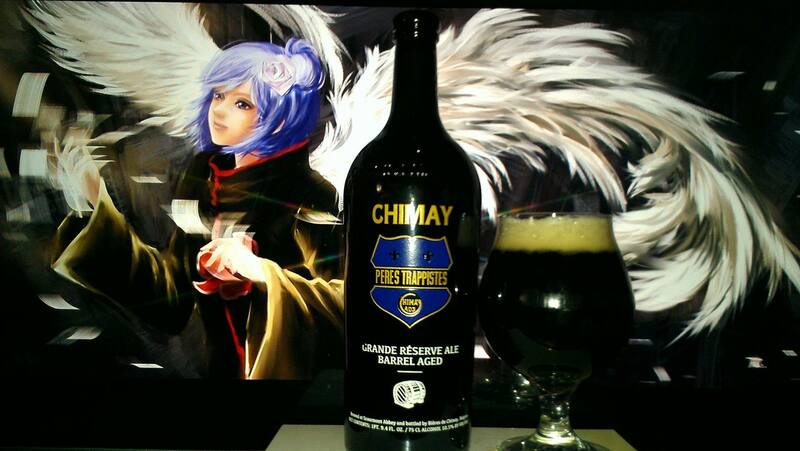 This 2016 edition of barrel-aged Chimay Bleue boasts an excellent blend of the characters of Chimay Bleue and Cognac. This balance between roundness and powerfulness is best appreciated between 6 months and 1 year after it is bottled. For this second batch, a mixture of barrels has been used. Produced in limited amounts using craft-brewing methods. The sophisticated bouquet is perfectly showcased when served at a temperature of between 10 and 12°C. I obtained this one at my local shop. Having tried the St. Bernardus abt 12 Oak aged, when I first saw this, I thought I must have it. I couldn’t be driven to buy this thought. At a $40+ price, it just seemed way too expensive. 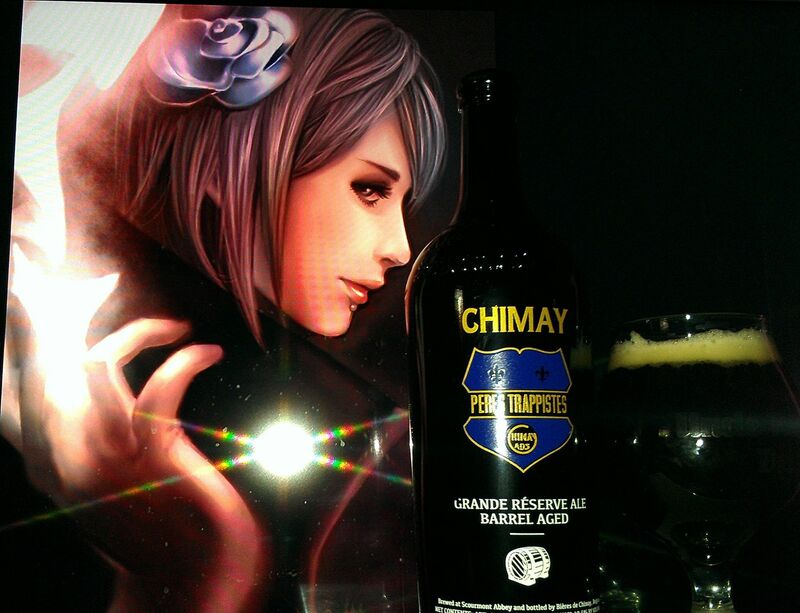 Yes, it is Chimay. 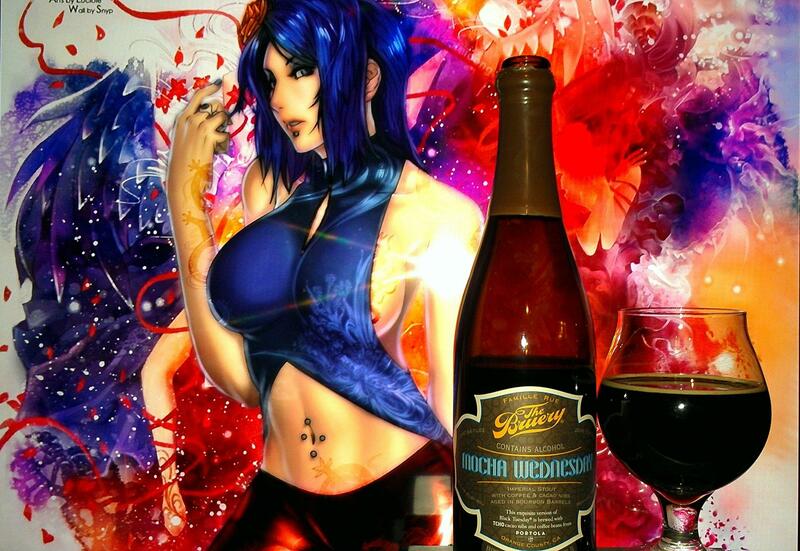 One of the best and world renounced Belgian Dark Strong ales but this time, in the barrel aged form. I actually passed this one up several times because of the price. 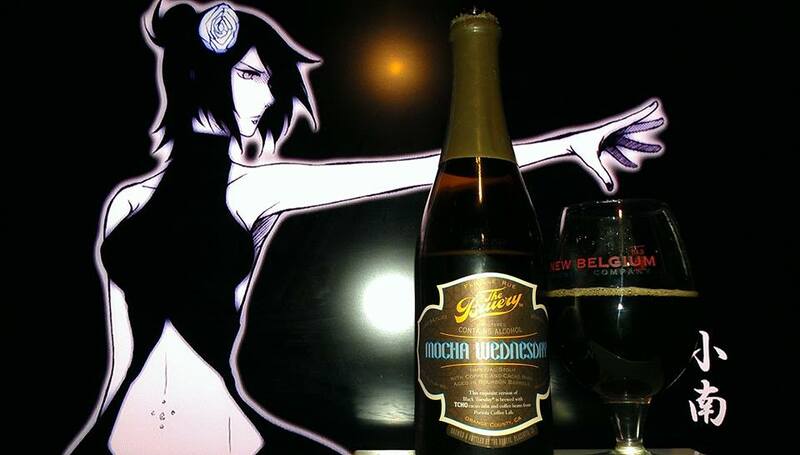 It wasn’t until I talked to my friend Richard Avila about this beer that it was clear what I had to do. 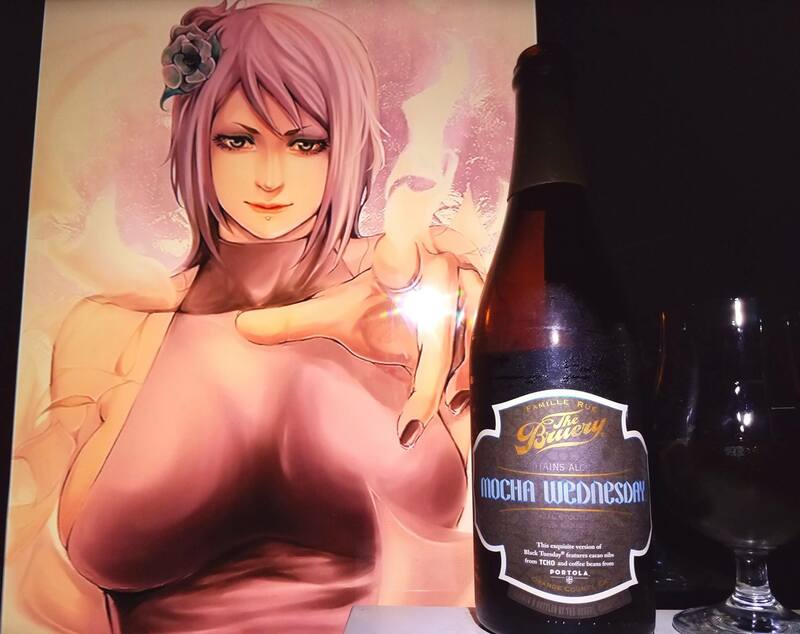 He had mentioned that, for a lover a Belgian brews, this is something very special and maybe not to try it, might be missing out on something that could well be loved by the community. He said I should try it for the fans of my work to see if they would be intrigued to get this one. This along with the fact that it was aged in several barrels and not just a single or a double but quadruply barrel aged. It was definitely a moving feat. 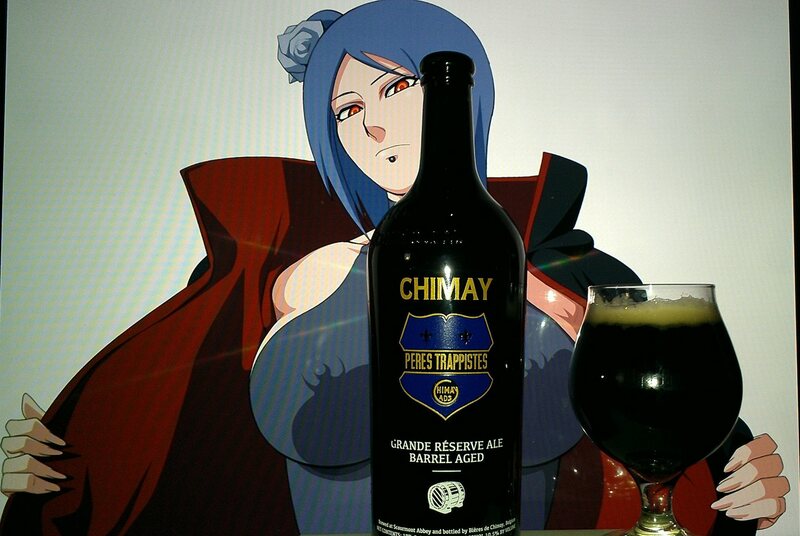 So without further ado, I finally bring you, the Barrel Aged Chimay Blue Reserve. Dark fruit raisins, plums, figs, prunes, dates, dark cherries, red wine sangria, Belgian dark candy sugar, Amber candy sugar, cane sugar, rock candy, grilled bananas, clove spice, toasted coconut, piloncillo sugar cone, pecan pie, hazelnut, dark chocolate, milk chocolate, Belgian Chocolate, port wine, Mexican Dulce de leche Cajeta, leche de cabra, tres leches/ three milks cake, flan, crème brulee, sweetened condensed milk, bananas and clove spice. Rich Dark candy sugar, Amber candy sugar, cane sugar, rock candy, oak, vanilla, cognac, dulce de leche caramel, crystalized caramel, piloncillo sugar cone, Mexican Dulce de leche Cajeta, leche de cabra, tres leches/ three milks cake, flan, crème brulee, sweetened condensed milk, Dark fruit raisins, plums, figs, prunes, dates, dark cherries, dark cherry yogurt, pecan pie, hazelnut, dark chocolate, milk chocolate, Belgian Chocolate, port wine, Chambord raspberry liqueur, marshmallows, toasted coconut, rocky road ice cream, almond joy, earthy and herbal hops, pilsner grain, fruit cake, molasses, anise, chestnut cake, red wine sangria, waffle cone, graham crackers, grilled bananas, stone fruit peach, apricot, clove spice, chocolate oatmeal cookie and Danish cream. Finishing with rich dark fruits, oak, caramel, vanilla, marshmallows, port wine, red wine, pecan pie, chestnuts, cognac notes, stone fruits, dark candy sugar and earthy hop notes. 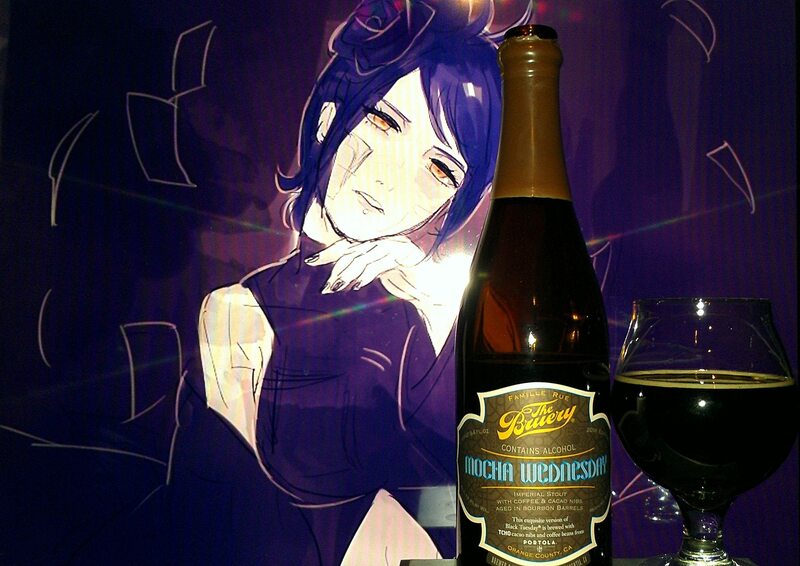 No alcohol in the taste, Abysmal Dark Crimson full body, smooth, syrupy, velvety and creamy mouthfeel and sipping drinkability. Even for the price, this exceptionally delicious bucket lister was just damn amazing. 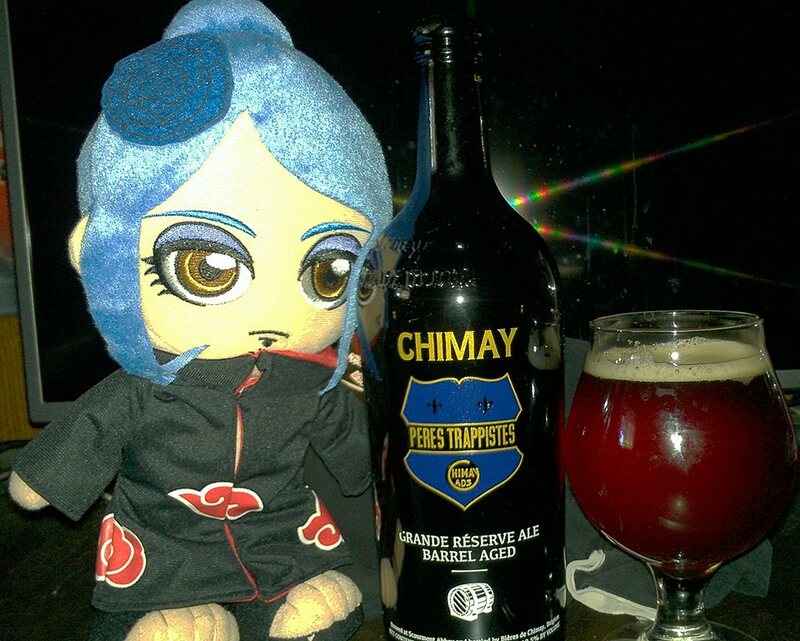 It has been a while since I tried Chimay Blue and the Reserve. Essentially, staples in my early days of craft beer Belgian experience. This one, just takes it to a whole new level. I have tried many Belgian Dark Strongs, all amazing and all over the top. This, however, this is some new godly potion. There is so much going on and all of it is so damn appeasing. Definitely, this one is to save for a very special occasion and supremely and highly recommended to all lovers of the Dark Belgian Arts. 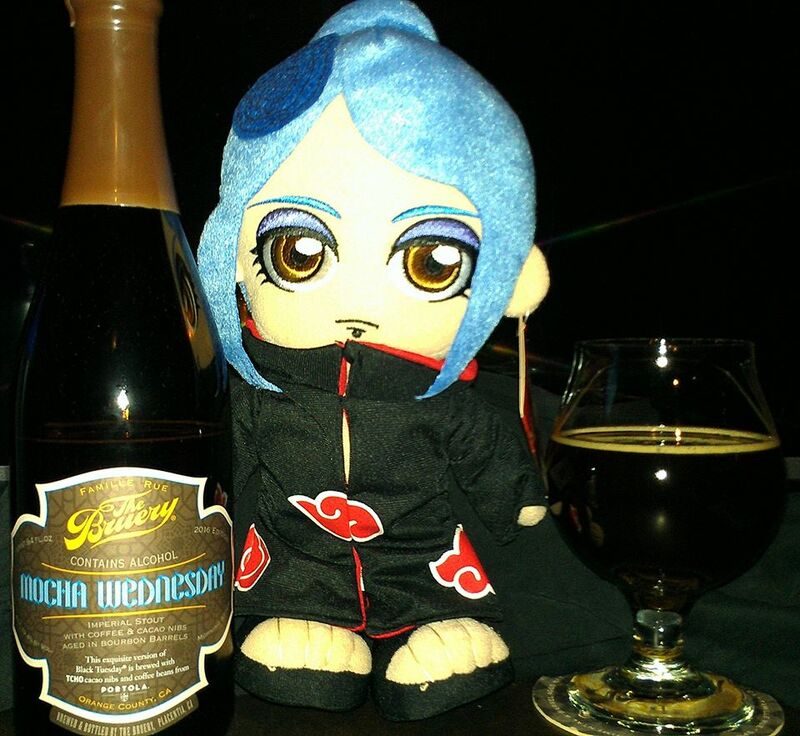 Konan from Naruto was chosen in this pairing to represent the Chimay Blue colors but her Akatsuki outfit also represents the Monks of Belgian of which compliments this beer’s Trappist origin. 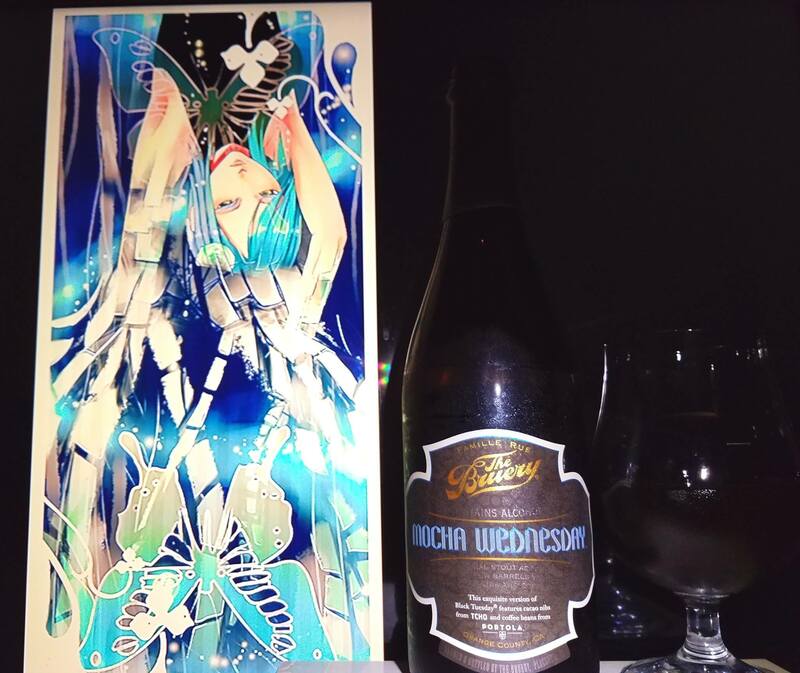 Also, the fact that she can create angel wings also coincided with the divine beverage that this really is. 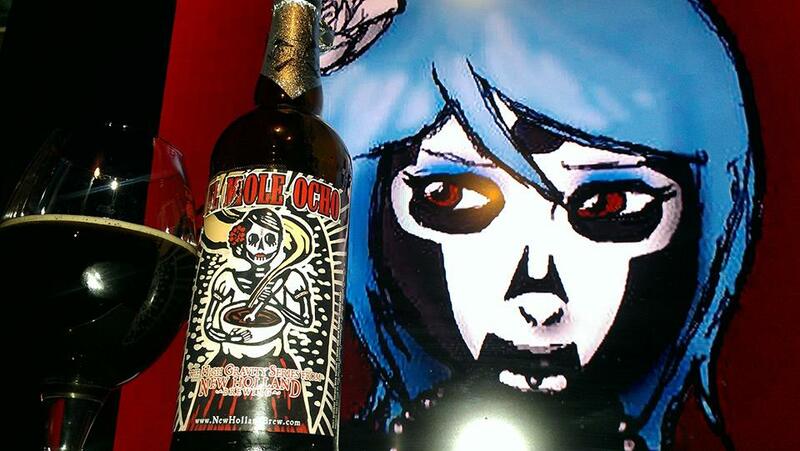 In a way, the quadruple barrel aging is really a way for her to “unleash”!! 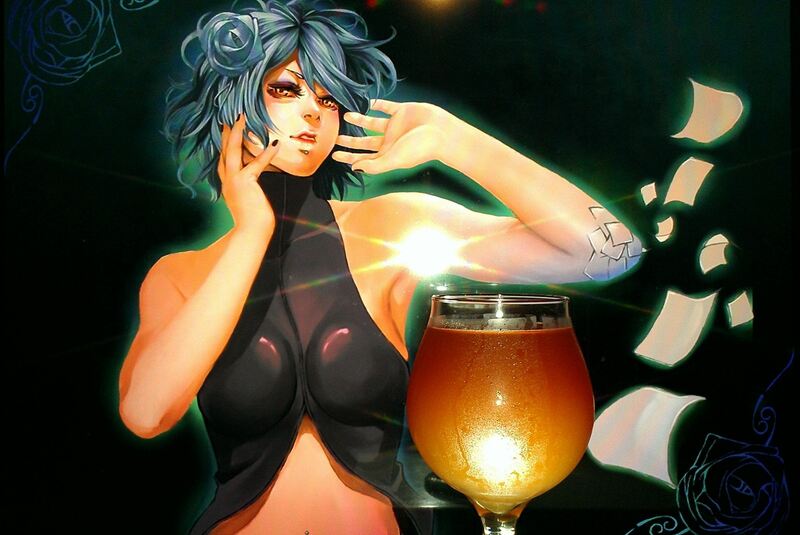 Naránjdanos Celestiales by Nubis Sanctum Ales is a 6 %ABV A Belgian Dubbel brewed with Oranges, Blueberries, Soft Candi Sugar and Coriander spice. Project# 13 was an idea for a beer which combined the flavors or Orange and Blueberries. The name of the beer comes from the Spanish combination of Oranges or Naranjas and Blueberries or Arandanos. 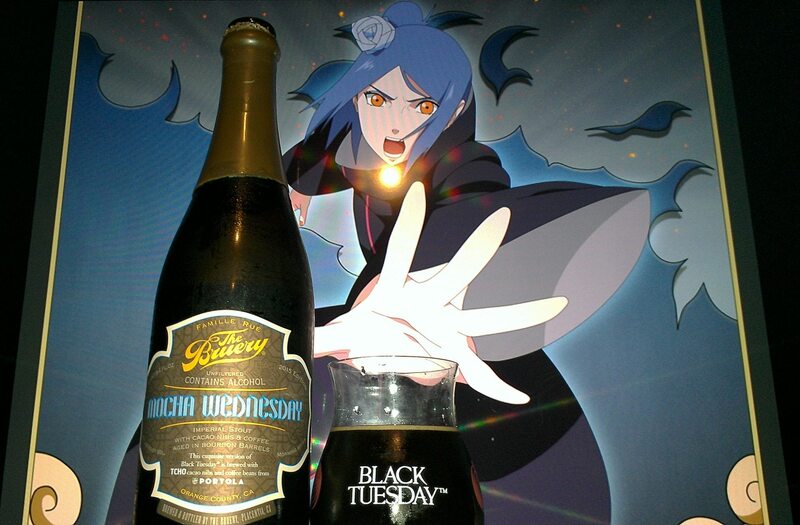 The fusion of the two and the fact that this is a Belgian Dubbel, like the ones Monks make in Abbeys, lead to the name of the Celestial OrangeBlueberries or Naránjdanos Celestiales. Originally, I was shooting for a chocolate orange and blueberry beer, but my friend Juan suggested otherwise in which case I did not add the chocolate. 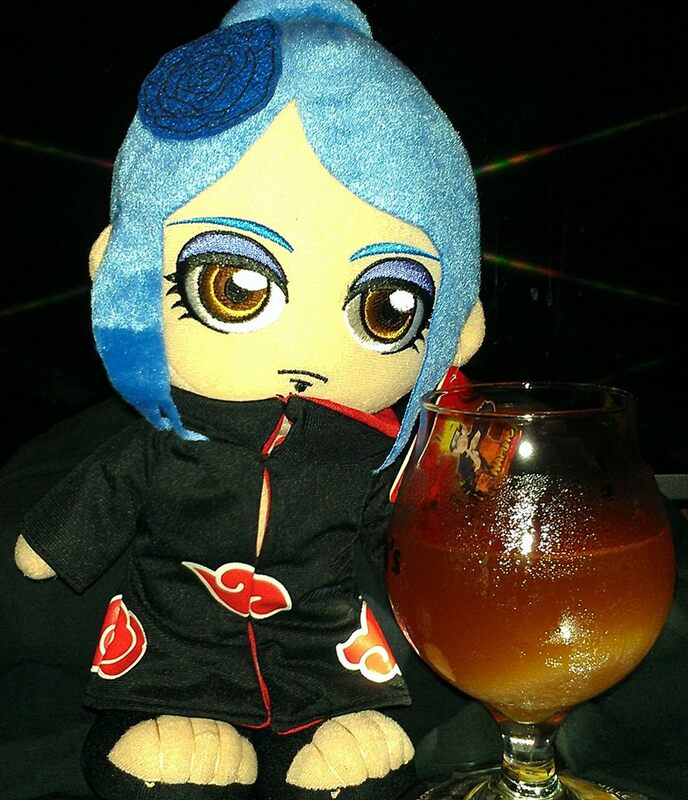 Namely being, he reminded me other delicious blueberry beers I had tried in the past. So to make the Blueberries stick out well with the oranges I also added coriander spice which frankly, with the orange zest, gave this fruity pebbles type of aromas. All and all, fermentation went through well and people seemed to love this one. Now, I take my personal thoughts on this one. Let’s take a look. Tart Blueberries, fruity pebbles hint, oranges, tart grapes, candi sugar, tangerine hints, brown sugar, lemon candy, stone fruit hints and dark fruits. Blueberries, Candi Sugar, Coriander spice, caramel, biscuit bread rye bread, tart grapes, citrus, orange zest, lemon candy, dark fruit raisin hints, figs, plums, tart cherry notes, sugar cane, brown sugar hints, apple notes, stone fruit apricot, peaches and tangerine notes. Finishes with some candi sugar notes, tart blueberry notes, citrus, coriander spice, tart fruit pebbles. No alcohol in the taste, Orange Honey full body, crisp, refreshing and silky mouthfeel and easy to drink. A very good light Dubbel. While I think the tarty blueberry adds some complexity, ultimately it has to be drunk at close to room temp to get more complexity. 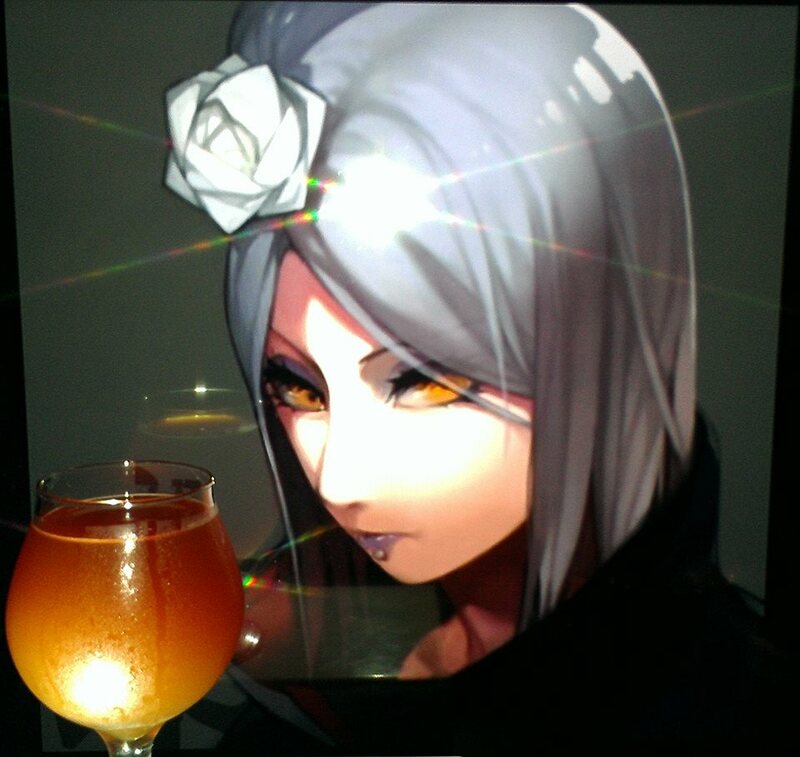 In cold temps it is easy to drink with tart and the citrucy notes. While I think this was good, I don’t think orange and blueberry may have not paired too well, only slightly. I think if I make this again, I might use a different fruit to pair with the orange or I think I will add the chocolate next time. Eitherway, still a delicious little homebrew. 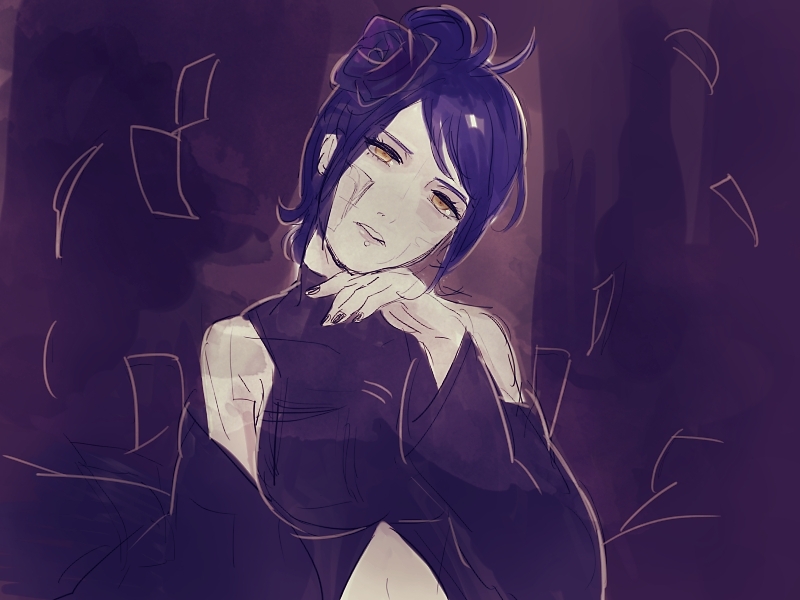 Konan from Naruto was used in this pairing as I wanted to pair with the ingredients of the oranges and blueberry flavors and colors as you can see from Konan’s hair and eyes. 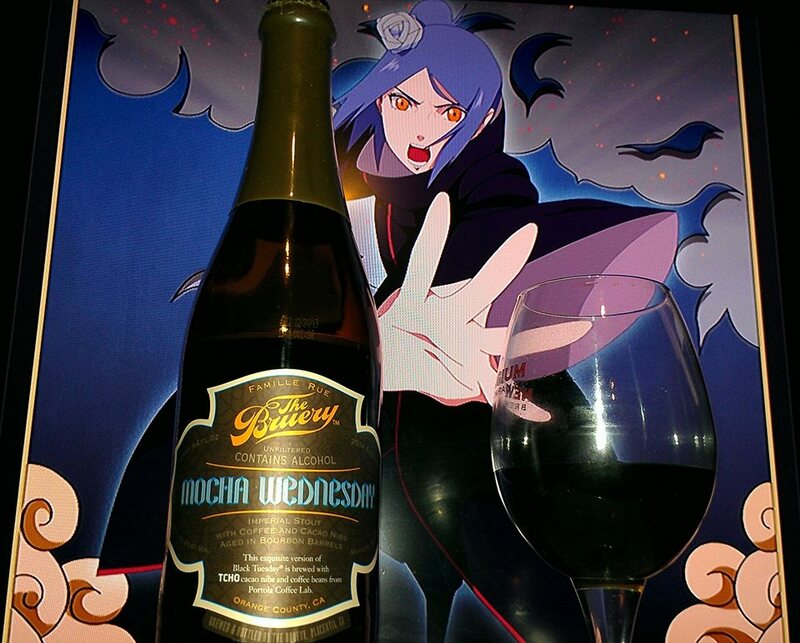 The fact that she is wearing a cloak is like the ones monks wear as this is a Belgian Dubbel so it definitely goes with the style. 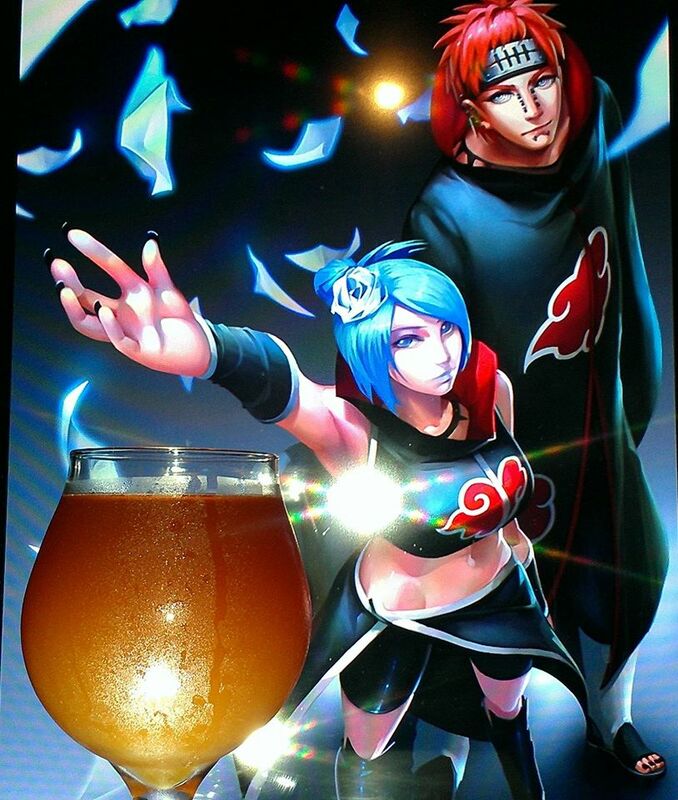 My intention with this beer is to pay tribute to Jiraiya’s original team of Nagato (Red like the body), Konan (Blueberries) and Yahiko (Oranges with the Orange Hair). All these characters were important in the Naruto Series. Our exploration into the flavors of mole, the legendary sauce of central Mexico. Malty aroma and rich, cocoa-laden body laced with an invigorating tinge of dried chilies and coffee. Pairings poultry, red meat, dark chocolate. Dia de Los Muertos, or Day of the Dead, in my tradition is a time when we pray for our loved ones who are no longer with us. It is a day in celebration and remembrance. 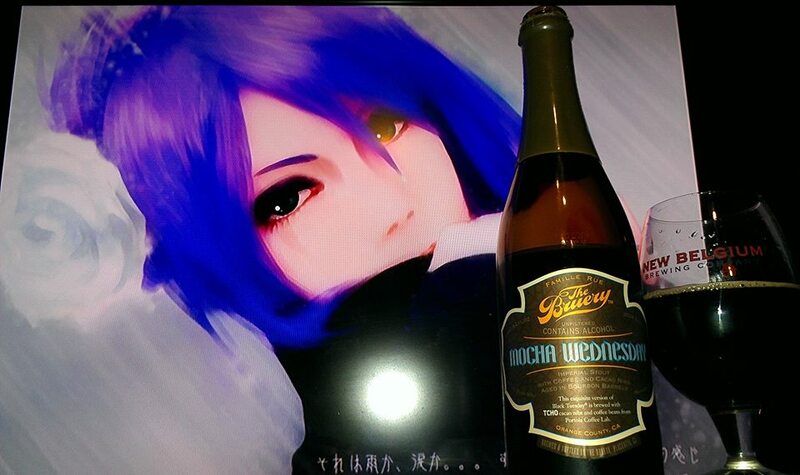 This day, I offer a review for a beer which came to me, just in time, online. 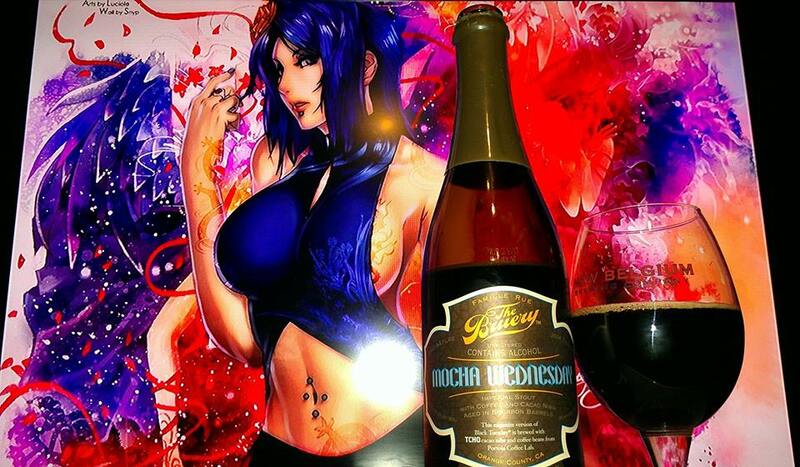 So I figured it be the perfect occasion to let you in on a special beer that is made with flavors of mole and spices. Flavors are of dark Chocolate, chocolate abuelita, bananas, cloves, cinnamon, champurrado, notes of chile, molasses, brown sugar, dark fruit notes, pecan notes, caramel, berries and toffee. 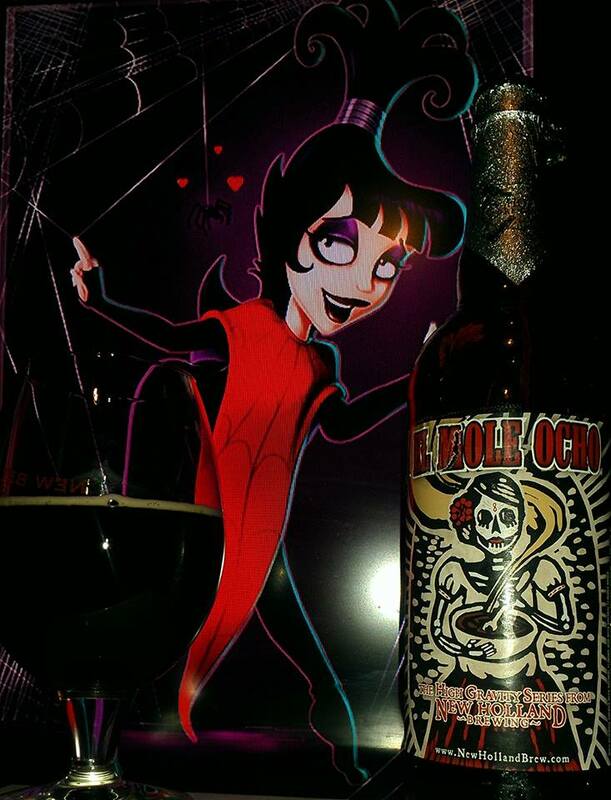 Overall, very good and a good pairing for Dia de los Muertos. 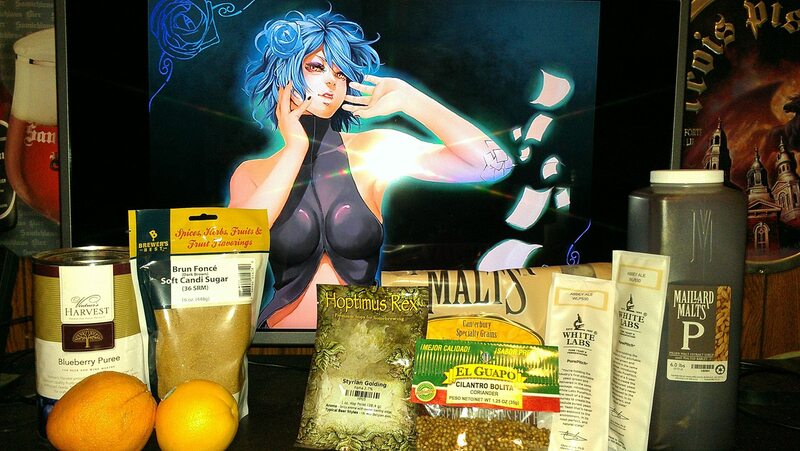 A great amount of good sweets and spices. Not enough of the heat which is good, because some people prefer not to have a lot of heat. 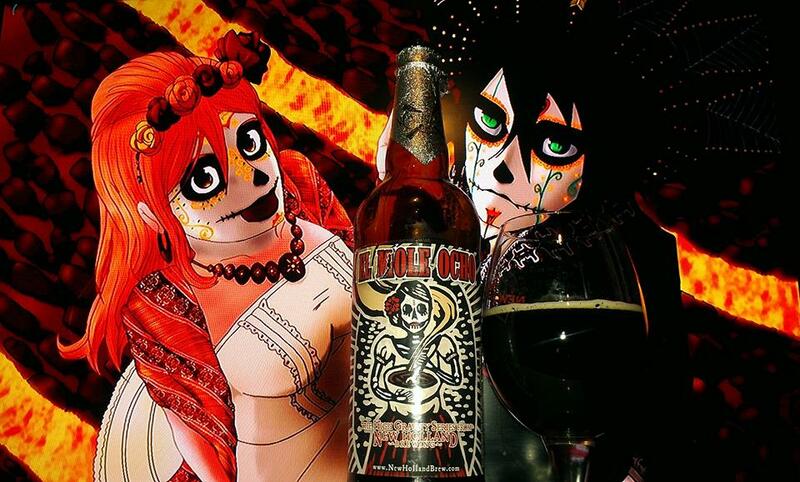 This beer reminds me of the New Belgium’s Mole Ale, however, the one that truly takes it in terms of mole beers, is Dark Lord De Muerte. That is intense stuff. 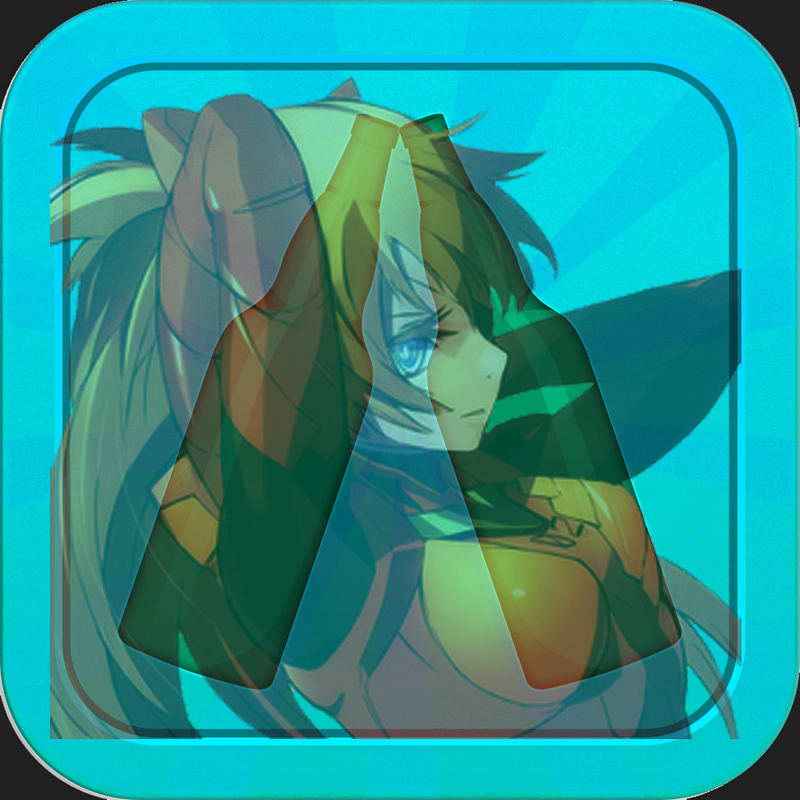 This one is a definite recommend though for sure. 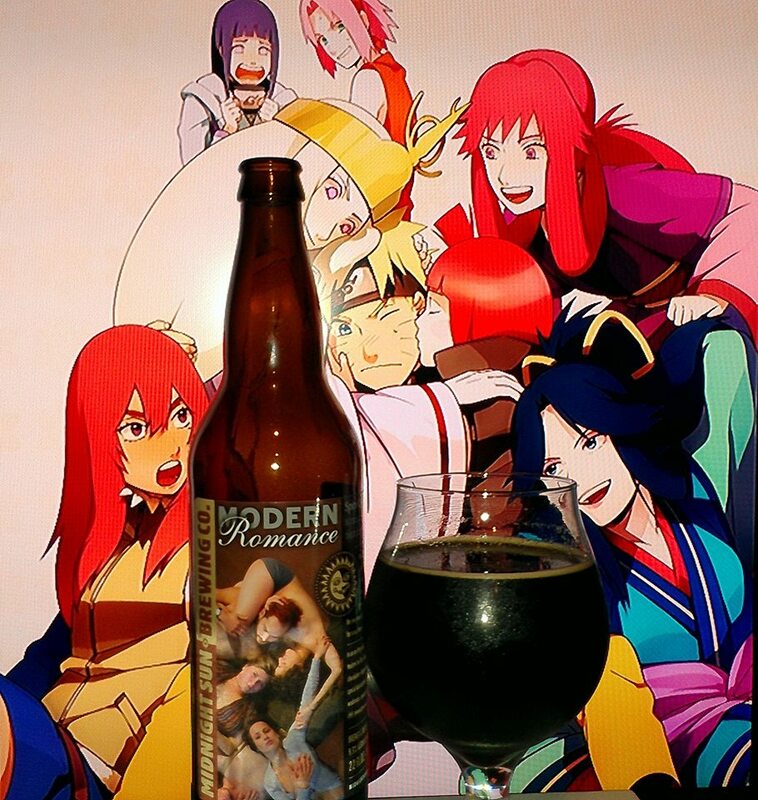 In the theme of the label and the day, it is easy to see what I was going with Orihime and Ulquiorra from Bleach, Lydia from Beetlejuice (Always speaking and fooling around with Ghoul Beetlejuice) and also Konan from Naruto. 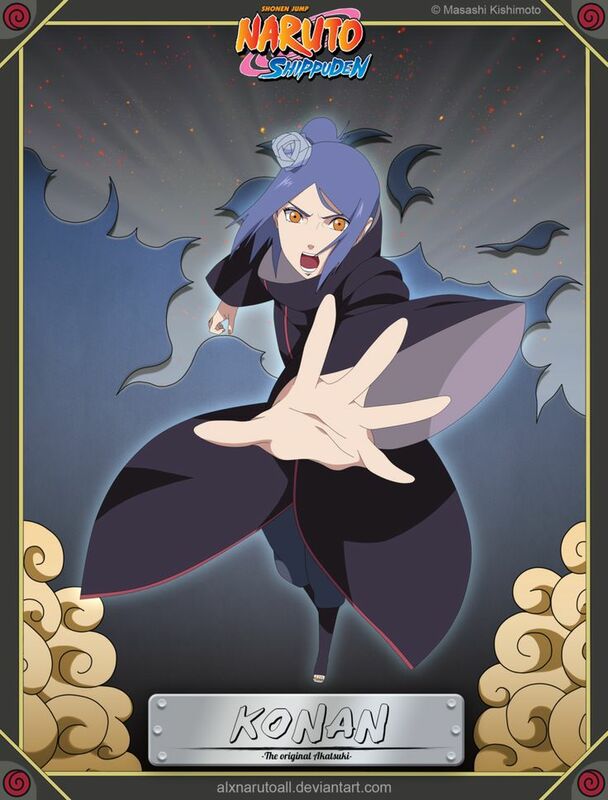 For Konan, this is not canon to the series but the way she looks is a special technique called Jashin in which the host does a ritual with a sample of the victim’s blood. 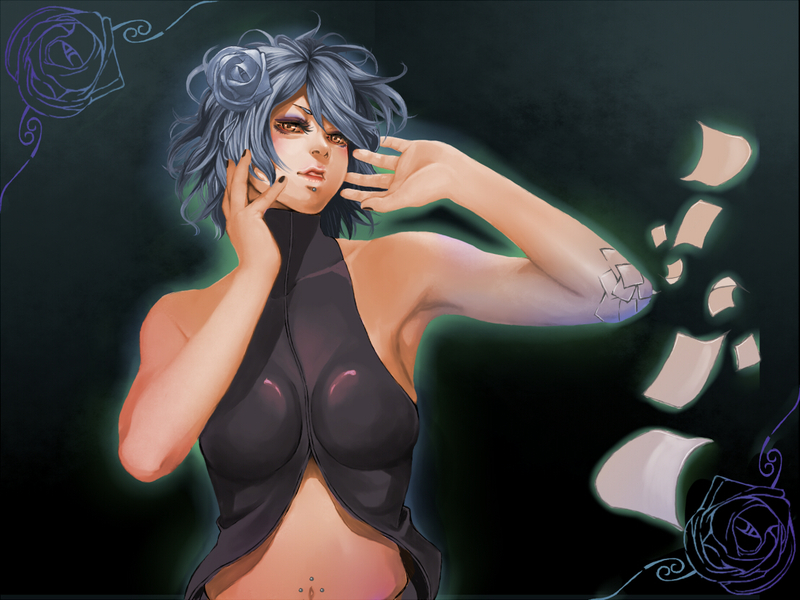 By committing sepukku, the host unleashes the same death onto the victim. The host survives the ritual impaling and the victim dies in its place. 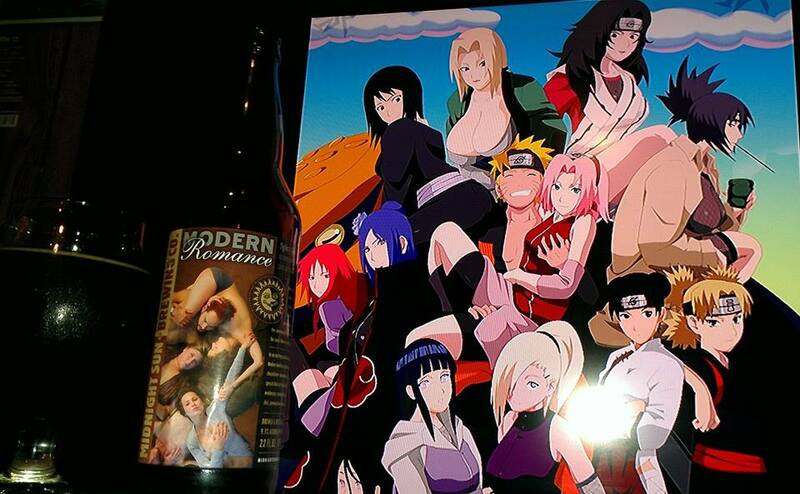 Pretty crazy stuff coming from the Naruto Universe. 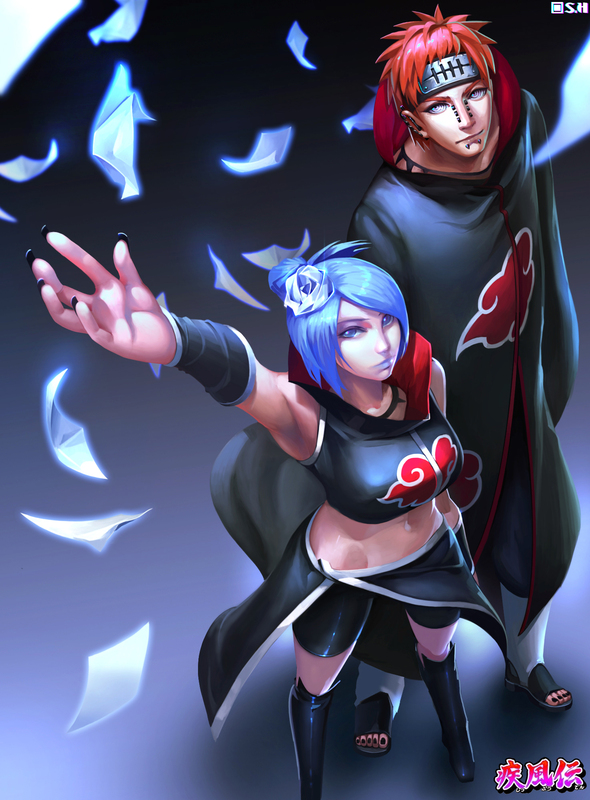 Aside from that though, Jashin style looks like a skeleton and Konan, always wearing a flower on her head, seems to fit right in with the label and theme. Cheers! !